North Metro Chorus is proud to have the following quartets associated with our chorus. Second place regional medalist quartet 2018, Region 16. Formed in 2013, S.L.A.M.! Quartet features the voices of four talented ladies who bring a wealth of varied musical and Barbershop experience to the stage. All four members of S.L.A.M.! 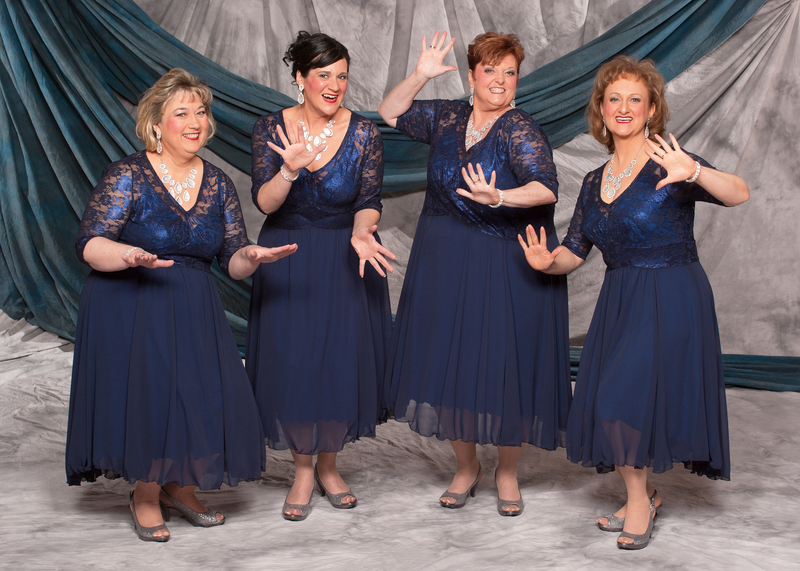 Quartet hail from Sweet Adelines International, Lake Ontario Region 16 and they each bring a unique element to their rich blend of four-part harmony. In May 2014, S.L.A.M.! was thrilled to become Region 16 Quartet Champions, earning them the honour of representing the Region at the International Contest in Baltimore, MD, USA in November 2014. Stephanie Foley (Baritone) originally from Greenville, South Carolina, is the Museum Curator at the Whitchurch Stouffville Museum, and lives in Aurora, ON. Linda Morrison (Tenor) is a valuable member of York Highlands Chorus Music Staff and directs Pineridge Chorus in Uxbridge, ON, where she resides. Annie Connett (Bass) originally from Yorkshire, England, lives in Mississauga, ON, and is a member of North Metro Chorus - 4 time International Chorus Champions. Martha DeClerq (Lead) lives in North York, is the Musical Director of York Highlands Chorus and is extremely active in regional administration and coaching. Strike A Chord has been singing together since 2016! Jenna (lead) and Ines (Bass) met while singing together in Vocal Motion Chorus (Calgary, Region 26). After relocating back to the GTA, they both had the itch to form a new quartet. Jenna reached out to her friends Ashaya (baritone) and Yve (tenor), who were non-barbershoppers at the time. We dove right it with lots of enthusiasm and hard work. At our first regional competition in 2016 we won the Novice Quartet Award. After about a year and a half of singing together, we decided to mix it up a little by completely switching voice parts (everyone except bass, that is). It’s been a wonderful work-in-progress adventure for us and it just keeps getting better! We look forward to sharing our voices with you next chance we get!